PDAgent controls print queues and authenticates print jobs using the Windows account name of the logged-in user. 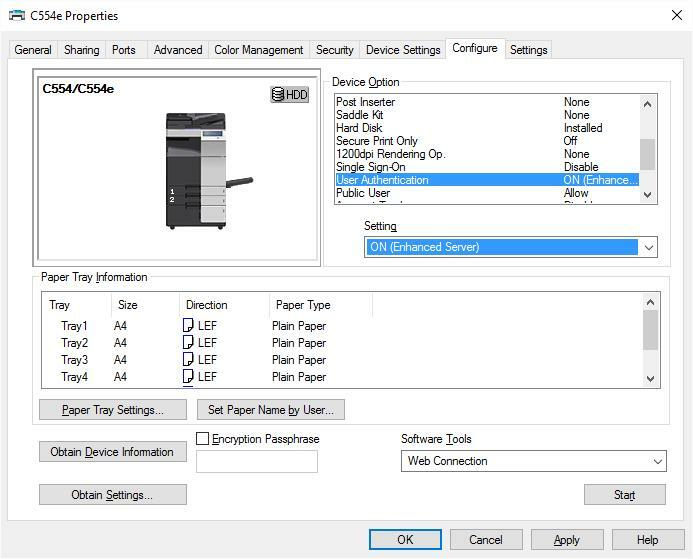 There may be some cases where it makes more sense not to use the PDAgent and have the workstations print directly to the printer with a PIN number set in the driver. For example, a site whose users’ bring their own laptops to work will probably not have a domain. This means they have no control over the Windows account names of the logged-in user. It may be that many users are logging in with the account name ‘User’. Installing PDAgent and having it control the queues and authenticate based on the account name will record all jobs under the same user record. In the example above it would be easier to manually create user records in the Resource Manager, and then simply insert the users’ PINs into their printer drivers. Their jobs will still be recorded in the Print Director database and there is no need to install the PDAgent or alter the user’s account name on their PC. Any credit limits and Rules will still be enforced. However, their jobs will not go into the ‘Follow Me’ system. They will have to collect their jobs at the printer to which they were sent. ID & Print can still be used on the printer to allow for secure print release. Double click on the printer on the right. Click the Print Jobs tab. In the Print Job Tracking frame, ensure the value in the Tracking method drop-down is Enhanced server counter notification. Navigate to User Management > Users. Choose the Department into which the User must be placed and click OK. The new user defaults set for this Department will be inherited. In the User Name text box, enter the user’s full name. In the Controller User ID text box, enter the PIN number the user will use to log in to the printers. Click the Auto button to generate a random, unique PIN number. If the user has a card and the printers make use of card swipe authentication, enter the user’s card number in the Card No text box. Allowing for Scan-to-me functionality on Konica Minolta and Lexmark Embedded Devices. Sending emails from within Resource Manager. Sending emails after Rule violations. We don’t want the PDAgent running on the users’ workstations because it will override the driver authentication and insert the PIN for the logged in user account as opposed to the PIN you want to insert. Either uninstall the PDAgent or open Services.msc and set PDAgent start-up type to Disabled. Open Control Panel > Devices and Printers. Right click the printer and choose Printer Properties. Click the Obtain Settings button. Now change the User Authentication setting to ON (Enhanced Server). If you changed any settings, click Apply. In Printing Preferences window, click the Basic tab. Click the Authentication/Account Track… button. Untick the Public checkbox and enter the user’s PIN number. Click the Verify button to check that it works.